Throughout the year, as part of our unit of inquiry into how we express ourselves, the children have been exploring ways of telling stories. Recently, a group of children have shown particular interest in the PuppetPals app on our iPads. As part of our writing focus on fictional narratives, the children have been conducting group and personal inquiries into how narrative fictions work, looking in particular at setting, characters and plot. In our writing workshops, the children are aware of many of the processes involved in writing. They know that not all work continues to publishing stage and that published work needs to be of high quality. As part of the viewing and presenting strand of our language curriculum the children have been working on voice projection and speaking clearly. Today, Aiden and Jaiden came to tell me that they had something important to share. It was a story that Aiden had created first using text and drawing. The boys had decided to work collaboratively to adapt Aiden’s original idea and retell the story using PuppetPals. They had spent a whole morning working on the story and were delighted with their work. Aiden: I think it’s the best we ever did. Please can you put it o the blog because we want to show everyone? Jaiden: We tried to do it so many times, like all day, and each time it’s better and better and now it’s ready to share. It was obvious from the body language of both children that this was a momentous occassion. They were clearly very proud their work. I could see they felt they had created something significant which they wanted to share with a wider audience. I was keen to respect and support the momentum of the occasion. The children didn’t need praise from me -this whole project had come from Aiden and Jaiden. The boys were self-motivated, and their own assessments of their creation were more powerful than any adult praise. I decided the most useful thing I could do was help them share their work. Over the year, we have talked a lot about digital footprints and about the need to think carefully about how we portray ourselves on line. I asked the boys if they thought their work was good enough to publish on YouTube. Aiden and Jaiden looked at each other. Jaiden: Wow! YouTube! We better check. Aiden :YouTube! I think it’s good enough. But I agree with Jaiden. We need to check. YouTube! The boys went off to find a quiet, private place to review their work. They came back after several minutes, literally jumping up and down with excitement. Aiden: We think it’s good. We listened carefully and it’s definitely good enough for publishing. Jaiden: We have loud voices and not too many characters. And the background matches the story. Aiden: And the story makes sense. Jaiden: It’s really good. It’s our best ever. Jaiden: I especially like how we photographed the characters from the original one. Aiden: Yeah! We did that because we wanted the characters to be the same. We exported the clip to YouTube. All the children were struck with awe and wonder that they had the power to create great works and share them on YouTube. 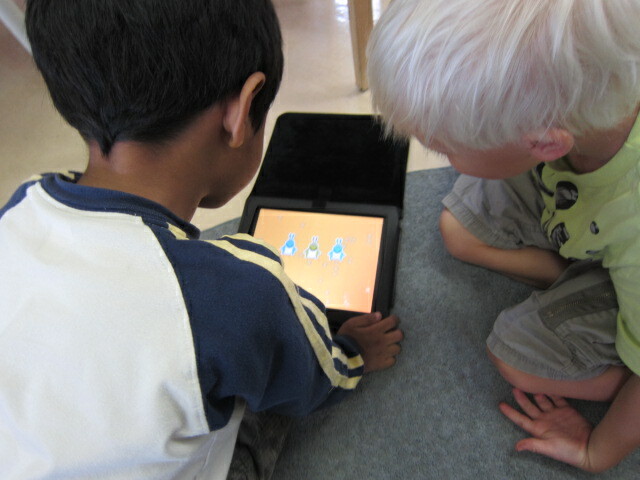 Yungi suggested tweeting a link of the YouTube clip to @KinderPals so they could wathc the story in Canada. There has been much talk in recent years about the role of technology in elementary school classrooms; talk about whether technology has a place, and if so, how best to use it to enhance teaching and learning. In this example, the technology complimented and enhanced our writing inquiry into narrative fiction and our overarching unit of inquiry into how we express ourselves. It empowered the children by enabling them to create a story independently and share work their work with a wider audience. The technology was not a substitute for a more traditional style of learning -it enabled the children to do new things in ways that were not previously possible. Albe’s mum came to read. She told us about the indigenous aboriginal people of Australia and their rich story telling culture. She chose a traditional aboriginal story about Tiddalik the frog. Below are two different versions of the story of Tiddalik. Here is a picture of Tiddalik in the dreamtime style by artist Michael J Connolly of Dreamtime Kullilla-Art. As we are learning in our unit of inquiry into how we express ourselves, the same story can be told in different ways. Loris Malaguzzi, an Italian early childhood specialist from Reggio Emilia wrote a poem about the many languages of childhood, called The Hundred Languages of Children. This poem has influenced early childhood practitioners all over the world and has encouraged teachers of young children to listen carefully to children’s many languages. Click on the video clip below to listen to the poem. We are currently working on a unit of inquiry into How We Express Ourselves. The central idea is that people use many different languages to communicate. Through mother tongue reading and through our current exploration for @KinderPals into different writing systems in English and Japanese, the children are becoming increasingly aware of the different spoken and written languages people use. We have also looked at the language of mathematics and have used numbers and mathematical symbols to tell simple stories. In music the children have been exploring the language of music including different forms of notation. Recently many of the children have shown an interest in puppetry. We looked at these YouTube clips of shadow puppets. We set up a shadow puppet area in the classroom using a projector and a screen. The children have been engaged in individual and group inquiries into which materials and designs work best for shadow puppets. What languages do you use to express your ideas and feelings? As part of our year long unit into personal learning journeys, the children have been thinking about the important things about them -the things that make them special and make them who they are. They made mind maps to show things that they thought people should know about them. As part of our unit of inquiry into the properties of materials, we have been exploring ways of combining and changing materials. Recently, some of the children have been showing an interest in laboratories and scientists. I emailed one of the Middle/ High school science teachers and asked him if he could help foster the children’s interest. Mr Midgley came to visit, armed with some interesting looking equipment and materials. Mr Midgley left us with test tubes, pipettes, lab coats and googles so that the children could continue their explorations. The children would like to set up their own lab. We are planning to visit Mr Midgley in his lab, so we can learn how to organize our classroom lab and get some more ideas for experiments. We have been visiting the park opposite school throughout the year to observe how nature changes with the seasons. The children have enjoyed paddling in the stream in summer and climbing over the rocks in winter when there are no plants to damage. They have watched the leaves change color and have gathered fallen leaves for classroom collages. More recently they have visited the park to view the cherry blossoms and the arrival of spring. The children are developing an appreciation of the awe and wonder of nature. They have recorded their observations in sketchbooks that show how the park changes over the course of a year. The children have made connections between how the park changes over time and our unit of inquiry into where we are in place and time. In Japanese culture, the passing of seasons is a significant event and our recognition of the changing seasons in school helps children to make connections to our host country culture. Our units of inquiry often overlap and learning in one area deepens conceptual understanding in another area. Throughout the year we have observed that several of the children have shown a strong and sustained interest in kanji. We asked the children what they knew about kanji. Some children wanted to show how they could write some kanji. We decided to have a “kanji writing time”. We are aware that some children have had lots of experience with kanji already and others have had no previous experience. We wanted to make the engagement accessible to everyone so we suggested that children could work independently or collaboratively, and they could write Japanese kanji or they could experiment with making their own kanji. We got books out of the library for children to copy if they wanted. The following day, the children worked in the art room with special brushes and ink to explore kanji writing further. We have set up a kanji writing area in our classroom so that those children who are interested can come back again and again to conduct their own personal inquiries. We wonder if they will make connections to our units of inquiry into How We Express Ourselves, Exploring Materials and Japanese Culture. At the moment, some children are primarily interested in the ink and brushes, and want to explore the materials. Other children seem more concerned with expressing their ideas. We are wondering if some children might be interested in other non-alphabetic writing systems such as hieroglyphics. We wait with interest to see where the children take this. The most recent development has been a mathematical inquiry as the children used various materials and strategies to try and work out how much money we will need to buy more fish for our fish tank. We began with a discussion about how many fish and plants we should buy. The children decided that we should have a total of six fish and and six plants. Several children pointed out that since we already have one fish, we would only need to buy five more fish. I explained to the children that we could estimate the approximate cost of fish and plants based on the information we had gathered from our research. I decided to work in $US rather than Japanese yen, as I thought it would be easier for the children to work with smaller numbers. I estimated that one fish would cost approximately $5 and one plant would cost approximately $3. I wrote the information on the white board so that the children could refer back to it during their inquiry. I thought about whether I would guide the children’s inquiries at this stage and decided not to give them suggestions, and instead to observe the ideas and strategies the children came up with. Some children chose to work by themselves and others sought out partners. Although there was a wide range in the level of the children’s mathematical understanding, everyone took the work very seriously. Some children selected materials to help them count, others used fingers, and still others went for paper and pencil. Children used pictures, arrows, tables and letters to show their mathematical thinking. They discussed their findings and puzzled over conflicting answers. The video clip below shows the depth of mathematical thinking and, at times, frustration, as two children compare their answers. The look of delight and satisfaction is evident on both children’s faces as they finally solve the problem! It reminded me once again of the importance of giving children time to find out for themselves, rather than giving them the answers. iPads in Kindergarten: tools or toys? A year ago, our school decided to invest in a set of 15 iPads to be shared between the Kindergarten and Grade 1 classes. Over the last year, teachers and students have been exploring, reviewing and reflecting on ways to use iPads to support teaching and learning in all areas of our curriculum. Zoe recently returned from a Digital Technology conference in Shanghai, where she had participated in a discussion about using iPads as tools rather than toys. Some of the things she had heard resonated strongly with her, and as she shared her thoughts, I found they resonated also with me. 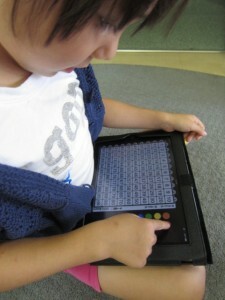 One thing that we agree on is that the iPads should support learning in other areas of the curriculum; tools, not toys. When the children use the apps, we make explicit the connections to learning across the curriculum. The IB Primary Years Program places inquiry and conceptual understanding at the heart of the curriculum and so we search for apps that will support children’s inquiries and help deepen their conceptual understandings. As the first half term drew to a close and the children reflected on their personal learning journeys so far, I asked them to think about how the iPads had helped them to learn. Below are some of their comments which show a glimpse of the children’s insight into the way digital technology can support their learning. Nia Well, when you have an author, like Eric Carle, you can read his books on the iPad and that’s better if you don’t know how to read. Maya Because I can do counting. I practiced and practiced with the iPad to be better and now I can be better. Olivia Sum stacker is my favourite because it’s quite tricky because you have to think about how to make all the stacks the right number. Sometimes one or two are right but the third one isn’t. And when you get really good you can do it in different languages and with different things like money, so you just keep getting better. Rika And it has Korea in one story and Yeseul can read Korea because you can choose if you want English or Japanese or Korea. Trenton I like Trace because you have to think how to make a path. And sometimes it is too hard. And then you have to think how it work. Phebe I like to do 100 square because I find patterns. Nikhil It’s good for Walter because he don’t speak English and so he can see how to do it. And I can show him on the iPad.